We have been repairing uPVC doors since 1980. 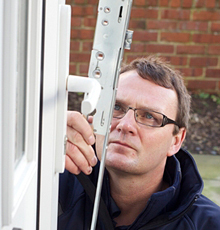 Our vast and excellent knowledge ensures we can repair all upvc doors! Our same day call out service means your door can be working again today. Regardless of the age of your door or who fitted it originally we can repair the door and make it work perfectly again. Save money and have your upvc door repaired. uPVC doors are secured by a what is termed a multipoint lock. As you lift the handle the locking points engage into keeps on the door frame and hold the door tight. This is then locked solid by turning the key in the barrel. If you can not open your upvc door or even lock it, then there is every chance the mechanism will have failed. This does not mean you will require a complete new door. Though if you were to contact a upvc door installer he would tell you that parts are not available for your door anymore, this is wrong. SF Locksmiths have access to the largest supply of upvc door mechanisms in Europe. This means that regardless of the age of your door or even who fitted it in the first place, we will be able to replace the multipoint lock. This will save you hundreds of pounds over changing what is probably a perfectly good door except for the faulty multipoint lock. When the original parts are not available a replacement lock offering at very least the same security but in most cases a higher level will be fitted, all with a two year guarantee. Our incredibly well stocked van also ensures that in 99% of call outs the repair is completed on the initial visit. After years of constant use the doors can get out of alignment. So when lifting the handle to secure the door, there can be resistance and this puts pressure on the gearbox in the multipoint lock, causing it to fail. This can be when the door is closed, so still secure or in an open position which is not good. It can also be to just general wear and tear. SF Locksmiths can save you hundreds of pounds. With a new uPVC door costing in the region of £700 including fitting and up to £1200 if you have side panels, windows or lead inserts, we want to save you money. The cost to replace the faulty multipoint lock would be in the region of £130 - £170 in total. There are many different types out there and sometimes we will look to upgrade the existing handles and euro cylinder at the same time. This will leave the door looking and operating like new. A full service of the door will also be completed, checking alignment of the hinges and keeps. We would expect this replacement lock to last in the region of 10-12 years. The savings that potentially this can save you are as you can see enormous. An example of the multipoint locks we have access to include Advocet, Mila, Lockmaste, Fullex, ERA, Yale, Union, Furr, Ferco, Millenco, ABT, GU, Surelock and many more. We understand that this can be an inconvenient situation and so offer a same day call out service for the benefit of our Sheffield customers. We are friendly and aim to never let you down. Even rang me to tell me he was running a bit late, which is very helpful when you wonder whether people are going to turn up or not.